On February 3rd and 4th 2016 representatives of the administrations of Germany, Netherlands, UK and US, and representatives of Iridium, CRAF and UK radio astronomy met at the Ofcom headquarters in London to discuss the protection of radio astronomy in the band 1610.6-1613.8 MHz from the new Iridium NEXT non-GSO satellite system. Iridium presented a new proposal to improve the compatibility of the NEXT satellites with radio astronomy. The proposed method is based on switching off individual satellite beams while passing over specific radio astronomy sites and redistributing the traffic load to nearby satellites in order to reduce the unwanted emissions from the satellites. Iridium expects that with this method the level of unwanted emissions in the radio astronomy band will be below those specified in ECC/DEC(09)02. However, no detailed information was provided during the meeting. Iridium agreed to provide more information to the administrations present at the meeting at a later time. 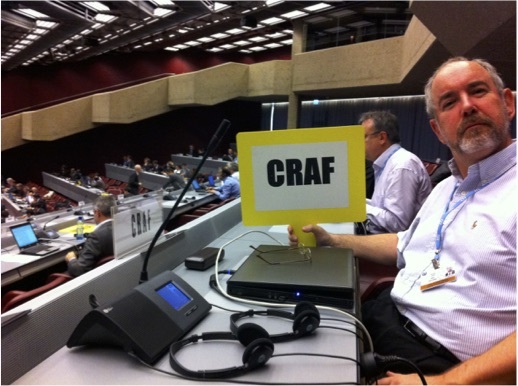 On 1 January 2016 Wim van Driel from the Observatoire de Paris in France started as the new chairman of CRAF. He took over from Hans van der Marel from ASTRON who was at the end of his term, having chaired CRAF over the last three years. Wim joined CRAF 18 years ago and has considerable experience in frequency management for radio astronomy. He has been CRAF chair before, from 2001 until 2003, and has also been IUCAF chair in 2003-2009. The new CRAF website is online! A lot of work has been put in a completely new design of the CRAF website. All relevant information from the old website, which has served for more than 15 years, has been transferred to the new website. It is much easier to navigate through the website and find the requested information. The new website is also easier to maintain and it is easier to add new information. With this website, CRAF is ready for the future under the umbrella of a new ESF.